Christian Pabst is pianist and composer. The press calls him an „extraordinary lyrical musician“. He gave concerts in South Africa, Estonia, Latvia, Slovakia, Italy, Great - Britain, Switzerland, Austria, Luxemburg, Belgium, Monaco, France, the Netherlands and Germany. He is currently studying Jazz-piano in the new European Jazz Master’s Programme at the Conservatorium van Amsterdam, the Conservatoire national supérieur de musique et de danse in Paris and at the Rytmisk Musikkonservatorium in Copenhagen. Christian Pabst was born 1984 in Saarlouis - a small German village next to the French border. In the age of 7, he starts to learn the piano. When he was 15 years old, Christian became the pianist of the local big band where his passion for jazz has its roots. Not long after, he recorded 2 CD’s and toured England and Sicily. In this band he met his future band members - bassist David Andres and drummer Andreas Klein – with whom he is still playing in his trio, 10 years after they’ve met. The young musicians founded first the band „Funkintension“. They won several prizes at the nationwide competition Jugend Jazzt 2005 in Germany and played on countless Jazzfestivals in Germany and abroad. In 2006, Christian decides to move to the Netherlands to study with Karel Boehlee and Rob van Bavel at the Conservatorium van Amsterdam. During his studies, he works intensively on his most important group: the Christian Pabst Trio. An ensemble which developed a huge musical trust during the ten years of its existence. The telepathic interplay and personal sound of the trio were honoured on many international competitions, e.g. International Jazz competition Hoeilaart, Belgium 2007, Biberacher Jazzpreis 2008, Internationaler Jazzwettbewerb Straubing 2008, Finalist Int. Jazz competition Bucharest, Rumania 2009, Finalist Dutch Jazz Competition 2010 including a performance at the North Sea Jazzfestival 2010. Furthermore, Christian received a scholarship for the Berklee College Of Music in Boston and was nominated for the Leidse Jazz Award 2009. 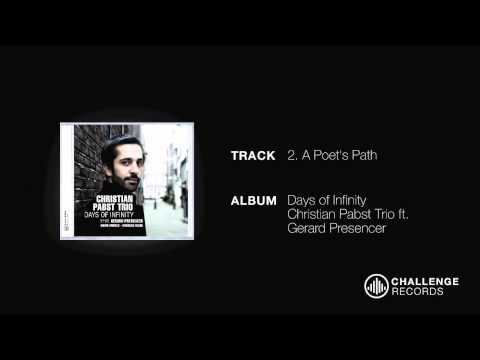 In May 2009, the Christian Pabst Trio wins the 1st prize at the Amersfoort Jazz Talent Award and got selected for the NORMA CD Productiefonds. With this budget, the trio records finally their debut “Days Of Infinity”. In February 2010, the group records 10 original compositions at the Fattoria Studios Osnabrück. British trumpet star Gerard Presencer joined the young musicians and contributed great solistic flights with his gentle flugelhorn- and trumpet sound. “Days of Infinity” will be released 2011 at Challenge International Records. From 2008 – 2009, Christian was the pianist of the BuJazzO’s (National German Youth Jazz Orchestra). He worked with conductors and artists such Ed Partyka, Jiggs Wigham, Steffen Schorn, Niels Klein, Julia Hülsman, Mike Herting, the Indian percussion-virtuosos Mr. Mani, Ramamani and Ramesh Shotam. A musical highlight was the project with the BJO (German Youth Symphony Orchestra). They toured through Germany with internationally renowned conductor Dennis Russel-Davies, including at celebrated performance at the Konzerthaus Berlin. The orchestras also played a tour through South Africa as part of the cultural pre-programme of the World Soccer Championship including performances in Cape Town, Johannesburg, Port Elisabeth, Pretoria and Bloemfontein. In 2011, Christian was chosen by a renowned jury, amongst others Harold Mabern Jr. and Eric Alexander, for the “generations”-Band 2011 at the international Masterclass in Frauenfeld, Switzerland. This ensemble will record a CD for Montreux Jazz Label featuring the Australian trombone-player Adrian Mears and go on a CD-Release Tour through Switzerland in summer 2011. Before finishing the conservatory, Christian became teacher for harmony and theory at the Pop-Departement of the Conservatory of Amsterdam. Furthermore, he is teaching piano and ensemble in many Workshops.